0-10 Kg, birth to 9 months approx. Installs with 2 vehicle seat belts in the car. Its official, the safest carrycot in the world. The results classed the Jane TRANSPORTER 2 Carrycot as the winner of its category obtaining the 4 stars that are given as the highest award of the Eurotest. The Transporter 2 is not just a carrycot, but also a Group 0 lie-flat restraint system which is especially recommended by health officials for longer journeys. And because your baby is completely protected at all times, this means that if he's sleeping in the carrycot in the house he can be safely moved to the car, taken to the shops, and brought back home again without ever having to be moved or disturbed from sleep. Unlike traditional infant car seats, the Transporter can be used 24/7 and for overnight sleeping when used with a mattress or for naps during the day, just like a conventional carrycot. The Transporter has a reinforced honeycomb structure that keeps it lightweight and gives it maximum safety in the event of an impact. The enveloping structure along with the extra protection in the polystyrene inner lining act as a protective barrier and shock absorber. Transporter is fitted with a fabric membrane offering better breathability for the baby. This technical fabric allows the air to circulate from the inside of the carrycot to the outside, ensuring perfect breathability. Transporter also has an extra ventilation system for the baby during the hottest months; this ventilation channel can be opened or closed as required. The backrest of the carrycot can be reclined in various positions from a button on the outside, ensuring that your baby is always as comfortable as possible. Newborn babies should ideally lie completely flat. As recommended by health officials, this position facilitates newborn respiration, nurtures the abdomen and aids optimal spinal development. Not only is the Transporters innovative design the response to all new parents who demand better adaptation of design to babies delicate anatomy and their lifestyle, it is also endorsed by recent medical reports. The Transporter recognises this important requirement and gives your child the best start in life. Like the rest of the Jané range, the Jané Transporter 2 Auto carrycot is fitted with the Pro-Fix system (patented). This means it can be connected quickly and safely with just one movement onto the pushchair chassis. With Jané everything is integrated into the system, so with the simple press of a button your travel system can be transformed. Healthiest for newborns. Unlike conventional infant car seats, Transporter 2 doesn't have any time restriction that a newborn can travel in it. Can be used as a 180º Lie-flat restraint system in your car. Officially the safest on the market. Fastening seat belt clamps that are more convenient and easier to use. Built-in ventilation system maintains a comfortable temperature for baby. Suitable for: Group 0, 0-10kg, birth to 9 months approx. Can be used as a lie-flat car seat. Unlike conventional infant car seats this lie-flat auto carrycot doesn’t have any time restrictions, meaning a newborn can travel in it for longer journeys non-stop. Integral protection. The shock absorbing material all around the edge. Reinforced honeycomb structure reduces weight for carrying and maximises structural integrity. System with extra aeration and ventilation: the membrane fabric makes it breathable and prevents the baby from getting cold. Carrying handle with 2 positions. 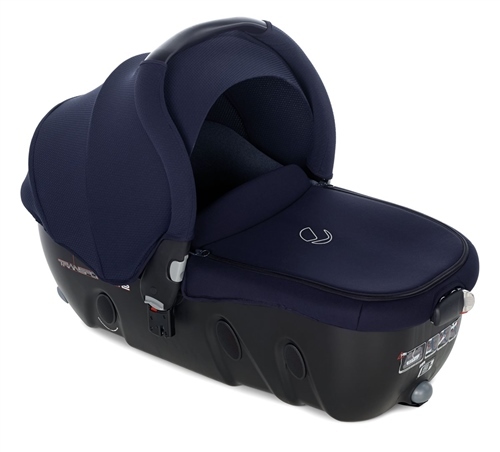 Transporter 2 carrycot is installed using two of your vehicle seat belts. It occupies two passenger seats, leaving one free for another car seat or passenger. Attaches to all Jane Pushchair, pram or chassis using the built-in Pro-Fix sytem. Which? have now fully tested the Rider pushchair, Transporter 2 carrycot and the Strata infant car seat in the Which? lab. All 3 products, the Rider pushchair, Transporter 2 carrycot & Strata infant car seats all received BESY BUY awards. If you’re not a member a Which? trial costs £1 and gives you access to all of our expert product reviews and buying advice.